You can only activate this card when your opponent activates a Continuous Trap Card. Negate the activation and the effcet of the card and destroy it. Royal Surrender is an okay Trap Card, I suppose, though on second thought that isn’t true at all. In actuality, there are only two commonly played Traps (and ONE ubiquitously played Trap) that you’ll get a chance to use this against: Call of the Haunted and (sometimes) Royal Decree. The effect is simple. It’s a Counter Trap that you negate Continuous Traps with. Why you’d use this instead of a simple Dust Tornado is beyond me, really, as chaining a Dust Tornado to a Continuous Trap will also stop it (not to mention DT can do a lot more than Royal Surrender). There’s no deck in which this card does particularly well. It’s a bit better in Traditional Format thanks to Imperial Order, but even there, Dust Tornado is better. Who else thought about French people when looking at the title of this card? Basically, it's a negation to continuous traps. It's anti-Royal Decree (hence the card name), anti-Gravity Bind, and anti-Wall of Revealing Light (great against a Last Turn player who pays 7,000 to stop an attack and doesn't have a Solemn down). There are other uses for the card, but they're not coming to mind, and usually MST and Dust Tornadoes are better answers. Since you have to wait for a turn to use this as well, it really puts them in the same category. 1/5 because we have a card that's already seeing play that does stuff better. Dust Tornado is already making a comeback, though, so I won't review that. Hell, 7 Tools is better than this. When was the last time you saw anyone playing 7 Tools? NEVER! Because people don't realize that 7 Tools is actually GOOD (nowhere near as good as Solemn Judgment, granted, but meh). This should have been a common. Most disappointing Normal Rare ever. That includes Fusionist. At least that's funny looking, and a level 3 Fusion Monster. 91 is the magic number of the day. Anyone wondering who Kirk is doesn't need to worry about it. I found out he enjoyed it when I mentioned his name from a review four months ago, so I thought this would be a good chance to make him mess his pants in excitement. Clear a line for the bathroom, folks. 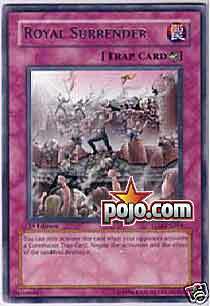 Today’s card is Royal Collapse, one of the more useless cards in TLM. problems with RS, the first being the lack of good/popular Continuous Traps. was a decline in Trap negation competition, maybe RS could see some play. But there aren’t, and there isn’t, and the end. Traditional: 1/5. Mega See Advanced. putting into effect new laws from the balcony of his prized castle. happened for an age; the Ents, er- people were going to war, er- rebel. Emperor’s Holiday, and stepped up punishment on all vigilantes. it was time for the Nintendo Revolution (coming out Spring 2006 [I think]). and the king’s knights fought valiantly in their Impenetrable Formations. purged of all evil, and the people were free. dawnyoshi Royal Surrender is just…bad. It’s a terrible card in constructed and should not see actual play, because there are SO many other cards out there that do this card’s job, and a lot more. Mystical Space Typhoon, Dust Tornado, Royal Decree, Call of the Haunted to resurrect Jinzo, and Solemn Judgment are a few examples of these cards. So what if Royal Surrender is a counter-trap. It’s still a terrible card. In limited, if you’re playing sealed and pull one of these, it’s a worthwhile side deck option as it negates Long Wolf, which is the all-mighty broken combo of sealed play with The Lost Millennium. If you’re playing draft, then pass this card to someone else. It’s not worth it. You can only activate this card when your opponent activates a Continuous Trap Card. Negate the activation and the effect of the card, and destroy it. Now granted, Traps aren't run in great numbers, let alone Continuous ones, but this is a card higher players should seriously take a look at. This single card can shut some decks down in a hurry. Just to name a few...however, as I said, this card run in 3's in oh say, just an offensive beatdown deck or something could be trouble. Against a Fire Princess or even in Agent deck, or a Stall deck, negating Gravity Bind is awesome. That could even mean trouble for an Exodia deck. This is just one of those cards that's probably going to be horribly ignored, and while the card isn't bad, and the potential IS there, it won't be used by enough (if any) to make it good. Royal Surrender is a Counter-Trap card, meaning it is Spell Speed 3. This is probably the cards strongest point: it can’t be countered except by other Spell Speed 3 cards. I believe that would only be Solemn Judgment, Seven Tools of the Bandit, and Trap Jammer. The thing is, when you see the effect, you wonder why? You see, Royal Surrender can only be activated in response to the activation of a Continuous Trap, which it then negates and destroys. The thing is, you could also activate a Dust Tornado in that situation (a Normal Trap) and just nuke the Continuous Trap that way. Since said Continuous Trap’s effect won’t kick in until the chain resolves, and it is destroyed by then, it does nothing. More over, all those other Counter-Traps that work on Royal Surrender also work against Dust Tornado, but Dust Tornado works against more things than Royal Surrender (namely destroying any Spells or Traps on your opponent’s side of the field). So this card is only useful when you can activate it in chain to a Continuous Trap (Call of the Haunted and Royal Decree do see a lot of play). Thing is, unless your opponent had a Spell Speed 2 option that would render Dust Tornado useless, Dust Tornado does it better. Traditional : 1/5-This may be a tad low, as it does do something, but it’s so obscure it’d be such a small fraction, I might as well round down. Advanced : 1.25/5-We lose the joy of Harpie’s Feather Duster in this format, so it gets a tiny boost to a reasonable percentage. Limited : 1.05/5-It can negate Lone Wolf. Apparently a card that is more important for telling a story than for playing the game, you’ll find it more valuable to look for shared characters in this art and that of other cards than you will for actual play.